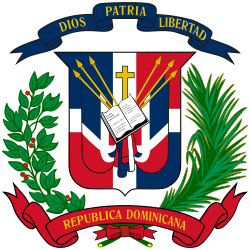 The coat of arms of the Dominican Republic, as described by Article 96 of the Dominican Constitution, has a shield supported by an olive branch (left) and a palm leaf (right); above the shield, a blue ribbon displays the national motto: Dios, Patria, Libertad (God, Fatherland, Freedom). Below the shield, there is a red ribbon with the words República Dominicana (Dominican Republic). In the center of the shield there is an opened Bible with a small cross above it, and on each side flanked by three spears, two of them holding Dominican flags. The Constitution does not specify in what page should be opened the Bible; only that is the "Book of Gospels, opened". In fact, only the 1916 Constitution said "opened in John, Chapter XIII" but that constitution was not valid because of the occupation of the country by United States. The National Flag of Dominican Republic has a small coat of arms in the center of the white cross. The first Dominican coat of arms was created by the first Dominican Constitution of 6 November 1844 but it was frequently changed until 1913; sometimes, two different coats of arms were used at the same time. The official Dominican coat of arms, or Great Seal of the Nation, was established in 1913, when Adolfo Nouel was the President of the Dominican Republic. ↑ Asamblea Nacional. "Constitución Política de la República Dominicana de 2002" (in Spanish). Retrieved 2007-09-20. ↑ Matos González, Ramiro (1996). La Bandera y el Escudo Dominicano (in Spanish). Santo Domingo: Editora Corripio. pp. 277–280. This page was last changed on 14 April 2018, at 22:23.